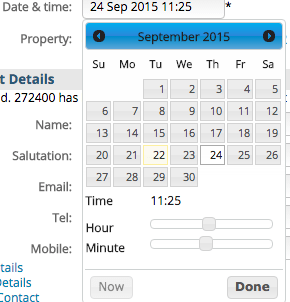 Choosing the date and time of an event in BDP is done via a combination of picking the date from a calendar and moving the Hours and Minutes sliders to set the exact time. The minutes slider advances in increments of 5 minutes. To skip forwards or backwards one month at a time, use the arrows adjacent to the month label. If you click in the dashboard calendar to enter an appointment, BDP will detect where you have clicked and will set that as the date/time. This can be changed easily using the date and time selector.